The city describes the memorial at the Bell Homestead National Historic Site as a "cherished part of the city’s history." The City of Brantford is asking for help after a "cherished" 101-year-old bronze plaque commemorating the invention of the telephone was stolen overnight. Police say city employees alerted them to the fact the plaque had been "forcefully removed" from the monument on Wednesday. "It's something we're really upset about and [were] saddened to learn," said city spokesperson Maria Visocchi. "It is obviously a very cherished part of the city's history and our heritage and we would really like the public's assistance in trying to get it back." The dedication plaque was bolted to the memorial at Bell Memorial Park for more than a century. It was about two feet by two-and-a-half feet and hefty, so Visocchi said the city suspects the theft was planned. "It would be very heavy, because it's made of solid bronze, but probably a couple of strong people could carry it away," she explained. "They would need specific tools to get it un-affixed from the concrete." 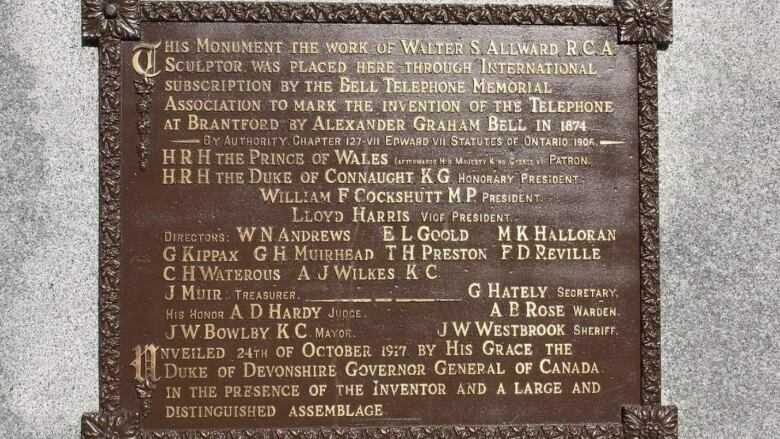 The plaque reads, in part: "This monument … was placed here through international subscription by the bell telephone memorial association to mark the invention of the telephone at Brantford by Alexander Graham Bell in 1874." The inscription also states the plaque was unveiled on Oct. 24, 1917 by the governor general of Canada and "in the presence of the inventor." Officials are asking whoever took the plaque to return it to city hall at 100 Wellington Square. Anyone with information about the theft is asked to call Brantford police at 519-756-0113.